Konjiam Resort | Konjiam Resort | Ecosign Mountain Resort Planners Ltd.
South Korea has had a dynamic and rapidly expanding economy during the past several decades, with Koreans finding themselves with much more leisure time and disposable income to pursue recreational activities such as Alpine skiing and snowboarding. Participation in skiing and snowboarding has increased five-fold from 1.35 million skier visits in the 1992-93 season to 6.5 million skier visits in the 2010/11 season. 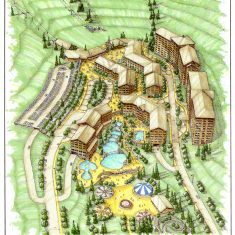 During that time, eleven new resorts were built to service this large (45 million) and rapidly expanding market. 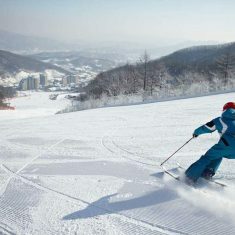 Ecosign was approached by Dahwa Industries Corporation, a subsidiary of the LG Group in 1994 to design a new ski resort at the Konjiam Resort which is situated approximately 45 kilometers south of Seoul, South Korea. 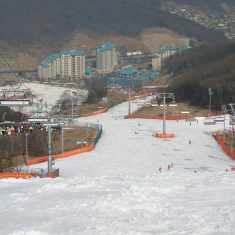 A new ski area was built in 2007 and 2008 near The Konjiam Golf and Country club and opened on December 19, 2008, based upon the Ecosign Ski Area Master Plan. Dahwa Industries installed five 6-seater detachable chairlifts and one 4-seater detachable chairlift with a combined hourly capacity of 14,740 persons per hour. 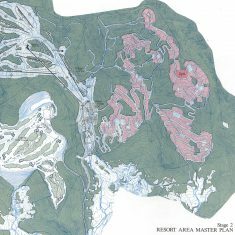 These five lifts provide access to eleven main ski trails; most ranging from 50 to 150 meters in width. 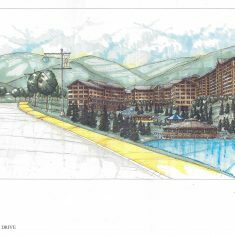 A full resort center was constructed with a large ski house on the snow front apron, a four-level parking tower and adjacent surface parking. 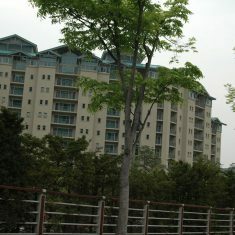 A commercial center with water park and four tower buildings were constructed to fill out the resort. 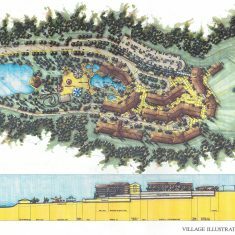 The resort village facilities are also based upon Ecosign’s conceptual Master Plan and include 476 hotel class condominium rooms, ski house, ski rental shop, restaurants and shopping areas. The resort has enjoyed great success rising to 500,000 skier visits per year. The resort sells skiing in one, two, three, four, six and eight-hour segments and is open from 9:00 a.m. through the night until 4:00 a.m., with a closure between 5:00 and 7:00 p.m. for snowmaking and grooming. 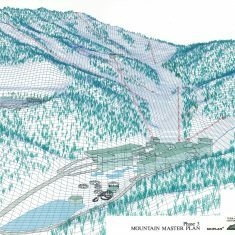 With this type of system, the resort handles over 17,000 skiers on its busiest days ever, but never more than 7,000 at one time as promised to their customers.